Our standard non-tilting winch-up model includes the aluminum frame that bolts to your swim platform, has 2x4 inch rail tubes with 1/8" wall-thickness that can be mounted to the Winch Frame at a variety of angles to fit the dimensions of your swim platform and height above the water, UHMW runners on top of the rails, stainless steel mounting hardware, and a 12 volt 2,000 pound winch with standard steel cable. These Deluxe features arenormally a $275 upgrade, but are FREE with April orders. They are described in paragraph 8 below. White powder coating is optional and available for HALF PRICE this month. See paragraph 9. 1) Tilt-Up (+$450 - FREE if ordered in April): OurTilt-Up feature is the most popular option and make our Rails unique in the industry. In addition to being adjustable for the perfect loading angle, they tilt up to a full upright position so your swim platform is completely open for play. 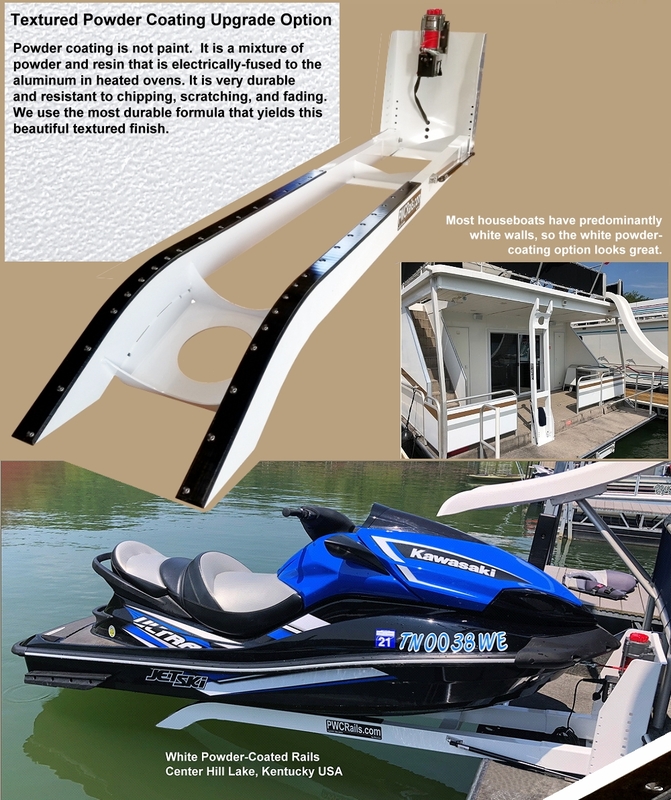 It includes 1 gas-shock lift-arm that makes it easy to raise the 1/8" wall thickness standard rail tubes where they remain upright until you are ready to lower and load your PWC. No pins or bolt-changes are necessary. You have full use of your swim platform when your PWC is unloaded. With our Tilt-Up Rails, there is no need to give that up. It allows you to mount it right over your swim ladder or next to your slide as shown here. It allows you to bring your ski boat, wakeboard boat, fishing boat, runabout, or PWC up alongside the back of your swim platform for easy loading and unloading. Conventional rails prevent that because they extend out the back. It makes it easier to maneuver around your slip, gas docks and small coves without anything sticking out the back of the houseboat. It makes it easier to bring the PWC up to the back of the swim platform to connect the winch line hook. It makes it easier to put the cover on your PWC before winching it up. Otherwise, it is difficult to reach the back by climbing up and over the PWC like factory rails...which requires a flexible gymnast! Click here to see pictures of Tilt-Up Rails. 2) Heavy Duty Rails (+$200): Regular Duty Rails have 1/8" wall-thickness 2x4 inch rectangular tubing, and are 8 feet long. This will safely handle modern 3-seater PWC's if you have a swim platform that is at least 4-feet from front to rear. If it is shorter than 4 feet, we recommend the Heavy Duty Rails which are 1/4" thick tubing to handle the increased leverage and extended weight. If your swim platform is "close to 4 feet" another factor to consider is the size of your houseboat and how rough the water is where you cruise. A smaller houseboat will tend to "bounce" on the waves more than a larger boat, and that will add down-force on the Rails which would lead you to wanting the heavy duty rails. If you have any questions about whether or not you need heavy duty Rails, give us a call and we will discuss it with you. We will need to know the front-to-back length of your swim platform, the size of your PWC and houseboat, and where you cruise. Stronger. The same diameter synthetic rope is much stronger than steel cable. Even tow trucks are converting to synthetic. No kinks. Steel cable ALWAYS kinks and crosses on the winch drum (as do nylon straps). Kinks don't happen with synthetic rope. No memory. Steel cable becomes "springy" after being wound up on a drum. It makes it very difficult to handle and increases the kinks and bunching. No sharp barbs. Steel cable strands eventually break and will tear up your hands. You can handle Dyneema without gloves. Click here to see video comparisons of steel cable vs synthetic rope . Because you will be handling the cable so much, we strongly recommend the Synthetic Rope upgrade. 4) Marine Grade Falcon Winch (+$320 - FREE if ordered in April) : The standard winch is a 2,000 pound Warn utility winch. Falcon of America has designed a marine winch specifically for our application. It's foundation is a 2500 pound sealed winch used for ATV's and snow plows, so it is durable and made for wet conditions. We had them add a built-in relay and a 12-foot LED control tether that can be plugged in and then removed so no one else can unload your PWC. 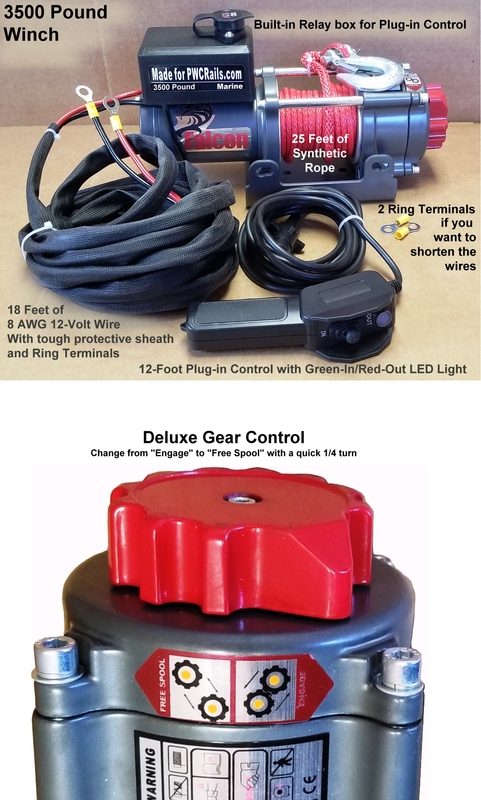 It comes with 18 feet of sheathed 8 AWG 12-volt wiring with ring terminals on the end to connect to your battery. You can see a full description here. 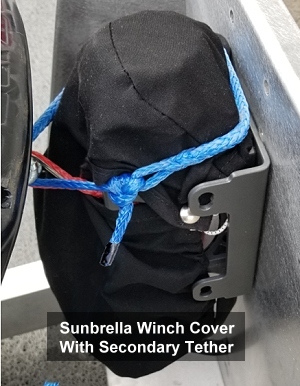 5) Sunbrella® Winch Cover Protector (+$35): Although the winches are marine grade, we recommend the Sunbrella® winch cover to provide all-weather protection. It has a bungee-cord in the hem, so it fits and holds tightly around the winch. The cable extends out through a snapped opening to your PWC. In other words, you will load your PWC, attach your tether, and then slip the Sunbrella Cover over the winch. 6) Second Gas Shock Lift Arm (+$45) : The Tilt-Up PWC Rail kit includes 1 heavy duty gas shock lift arm. It assists in lifting the Rails and it keeps them safely upright. Gas shocks are common on rear doors of mini-vans and other vehicles. Because of the angle, the Rails stay down when lowered. As you begin to raise them up, the angle and lifting power increases the higher they go which keeps the Rails fully upright. In our application, with the Rails down, it is initially about the same as lifting 50 pounds with the heavy duty Rails and 25 pounds with the regular duty Rails. As soon as you lift them a little, the gas shock begins to exert its lifting power. One lift arm is enough for the Regular Duty while we recommend a second lift arm for the heavy duty Rails. You will see it on the Order Form as a $45 option. 7) Synthetic Winch Tether (+$20 - FREE if ordered in April): Using a secondary tether so the load isn't always pulling on your winch motor and drum is important. You can read about our Synthetic Winch Tether here. 8) Deluxe Fully enclosed pivot-ends, Heavy duty nylon bushings, Rounded top edges under the UHMW glide runners (+275 - FREE if ordered in April): These features are pictured at the top of this page. The standard Rail tubes have an open end with a single-side pivot bracket and no nylon bushing. The rectangular tubing has a square edge while the deluxe rails have a rounded top edge which provides a broader surface against which your PWC will slide. 9) White Powder Coating (+400 - $200 if ordered in April): The is a new option, just added. 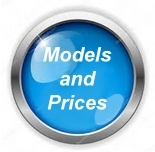 It is a beautiful white powder coating that is a $400 upgrade, but is being discounted to half that as an introductory offer for orders received through the rest of this month. Powder coating is not paint. It is a mixture of powder and resin that is electrically-fused to the aluminum in heated ovens. It is very durable and resistant to chipping, scratching, and fading. 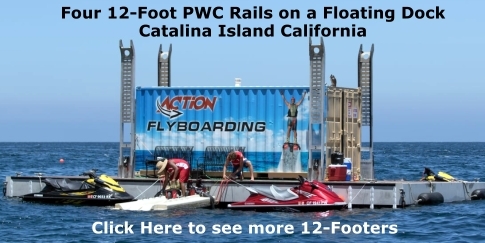 Most customers order their PWC Rails with all of the above options included. You will see these options on the printable PDF order form here. 9) 12-Foot Rails (+$475): The standard Rails are 8 feet long, and designed for mounting on swim platforms that are typically about 12 inches above the water. 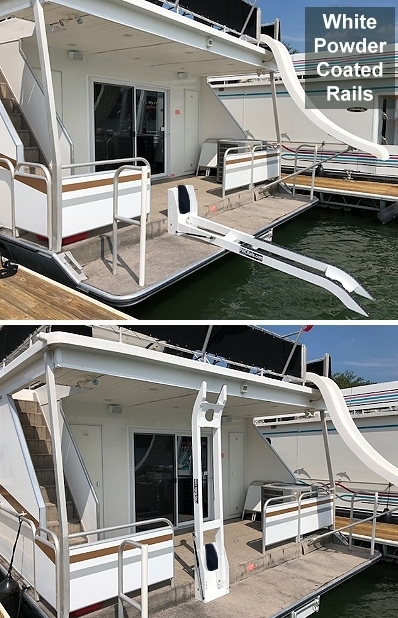 The longer 12-Foot Rails are designed for high-deck mounting such as docks, pontoon boats, or houseboats without swim platforms. You can read more about them here. You can see a dock-mount photo below. 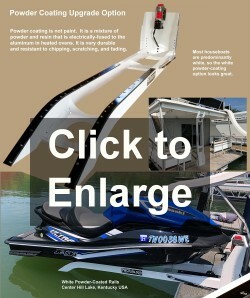 The 12-Foot Rails come with a Walkway welded between the Rails so you can walk out to the end when loading your PWC. 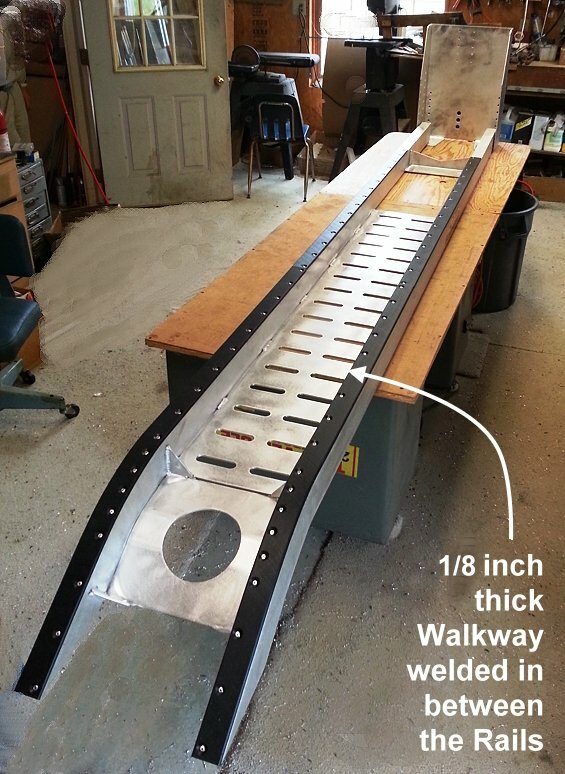 The Walkway is made out of rugged 1/8 inch thick aluminum with foot-traction cutouts as shown in this picture of a 12-Foot Rail in the shop.